Acer Aspire Switch 10 SW5-011-11JE is a 10.1 inch two in one detachable notebook with a bright touch display that supports multi gestures, a quad core Intel Atom processor, a 64GB Solid State Drive, 8 long hours of battery life, an ergonomic keyboard with spaced out keys, and Microsoft Office 2013 with the activation code included. 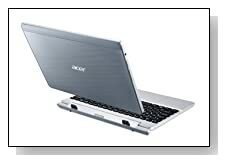 You can use it comfortably in notebook, tablet, display and tent modes. Acer Aspire Switch 10 comes with a 32-bit Intel Atom Quad-Core Z3745 processor at 1.33 GHz speed which goes up to 1.86 GHz with Intel Burst technology, 2 GB RAM with LPDDR3 technology, 64 GB Internal Storage and Windows 8.1 operating system. The atom quad core processor helps the system offer the power of a laptop and portability of a tablet in a single device- decent performance in daily tasks like internet surfing, word processing and spreadsheets while maintaining a long battery life. You have the integrated AcerCloud to have access to your multimedia and regular files wherever you are and on whatever device apart from the regular 64GB SSD- Solid State Drive. It is also compatible with the new Microsoft InstantGo technology which means the device stays connected on standby, the data stay in sync and the wake up time is less than 0.3 seconds so less of your precious time is wasted and you get fast and smooth performance. 10.1 inch HD Screen Active Matrix TFT Color LED backlit IPS touch display (bright picture and consistent colours at 178 degree wide viewing angles) supporting 5-point multi touch gestures with 1366 x 768 pixel resolution and Intel HD Graphics offers great bright visuals (350-nit display) when you're browsing the net, watching videos or playing games with the LumiFlex technology that helps optimise general brightness and improved contrast of colours when outdoors in sunlight. You have two front facing speakers and the High-definition audio support that let you hear decent sound. 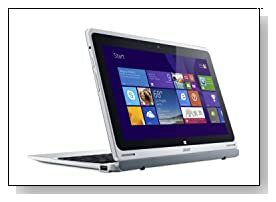 Elegant Silver Acer Switch 10 weighs just 1.29 pounds with measurements of 10.30 x 6.97 x 0.35 inches- it is a very slim and light machine that is both extremely portable and flexible with ease of switching between different modes. You can easily and smoothly remove the screen from the keyboard to use it as a tablet with the Snap Hinge magnet and latchless design, flip it to see a movie comfortably or use it in display mode to let other people view your presentations- switch between four modes to increase your productivity and fun. The 2-cell lithium polymer battery gives you around 8 hours of battery life so you can be away from a power outlet all day long without worrying about running out of battery. It comes with a good number of connectivity options too, such as the Acer Nplify 802.11a/b/g/n wireless LAN, Bluetooth 4.0, Micro-HDMI with HDCP support (tablet), Memory Card Reader (up to 32GB) supporting microSD and microSDXC, 1 x USB 2.0 port, 1 - Micro USB 2.0 port (on tablet) and the AC Adapter. Conclusion: The 10.1 inch Acer Aspire Switch 10 SW5-011-11JE offers a great experience with its four different modes of laptop, tablet, tent and display on a daily basis for whatever you’re doing. What we like most about it is the ease of switching between these modes and the durability and flexibility of the Snap Hinge, a very long battery life of 8 hours, speed by the processor and the 64GB SSD, the bright 350-nit display and the LumiFlex technology. For how much you’re paying you’re not getting a large memory and SATA hard drive or a Haswell Intel i5 processor to make it a top workhorse of a laptop but different kinds of modern features that come with being a 2-in-1 or perhaps a 4-in-1. It is quite affordable when you think about not buying a laptop and tablet separately and the inconvenience that may come with it. Highly recommended if you’re not after a conventional laptop but more something like a powerful convertible machine.